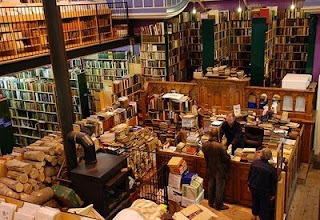 Jelica said: "My favourite book store is here in the Highlands: Leakey's Bookshop, Church Street, Inverness, Scotland. A great selection of second-hand books on every subject. Original prints and art for sale. A lovely gallery cafe." It seems that the bookstore-in-a-church concept is quite appealing to bookstore owners for this is another one of such kind (second on Bookstore Guide, besides Selexyz Dominicanen) - located in an old Gaelic Church in the Scottish Highlands, in a city near the famous Loch Ness. 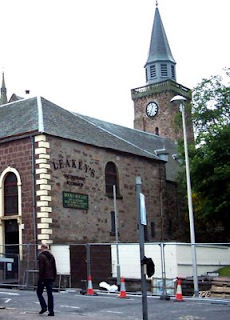 Leakey's Second Hand Bookstore is considered to be one of the largest second-hand bookstores in Scotland with a general stock of over 100,000 books. The bookstores is quite well known, not just over Inverness but throughout Scotland, for its relaxed atmosphere in the busy town of Inverness, a bistro-style cafe (with home-made dishes and an open fire - with an actual stove that runs on wood), exhibitions of local art and of course its stock of books piled up from the floor to the ceiling. Although thought to be the largest second-hand bookstore in Scotland, its owner Charles Leakey argues by saying that size isn't everything. He opened the bookstore in Inverness in 1979 after relocating it from Hertfordshire to the St. Mary Gaelic Church. The historic feel of the place and being surrounded by old books and rare prints makes your book browsing even more pleasant. Besides old and rare prints, here you can also find many classic volumes and old maps. Therefore, if you're on your way to searching for the Loch Ness monster, make sure you stop in Inverness and visit this bookstore. I love this store - if I would dream of the perfect book-store, it would exactly look like this. I spented a very happy afternoon in Leakey's this summer. God, I miss Scotland! Quite agree - a brilliant shop, worth it for the books OR the cafe OR the roaring stove, let alone all three. And just a few minutes' walk from the railway station. Highly recommended - have spent many an entire morning browsing/buying followed by a nice lunch in the balcony cafe. If the beef lasagne is on, have it, it's excellent. It's my ambition to spend an entire DAY in Leakey's some time.